Rental Market Update – How Does Perth Compare? 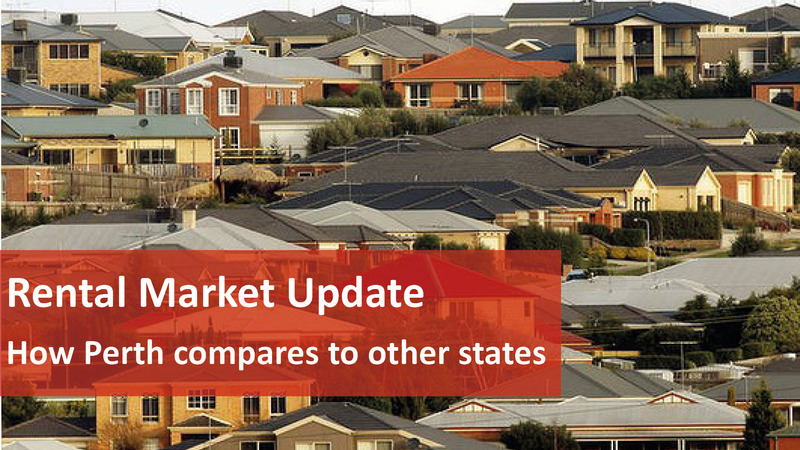 The latest market snapshot reveals that rental markets were mostly flat across all our capital cities over the September quarter with most rents remaining at the levels recorded over the previous June quarter. However, monthly vacancy rates remain tight overall, despite recent high levels of new residential construction. Hobart and Canberra the highest yields for investors – Sydney the lowest. Perth continued to buck the national trend with rents falling again over the quarter to be now at five-year lows. Vacancy rates, although still clearly the highest of all the capitals, are however now showing some early signs of stabilising. 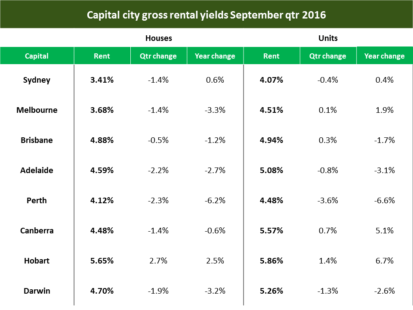 Canberra and Adelaide were the only capitals to record increases in rents over the September quarter reflecting ongoing shortages of rental properties in those cities. Melbourne and Canberra were the only capitals to record increases in house rents over the year ending the September quarter. Annual unit rents however increased in all capitals except Adelaide which was flat, and Perth and Darwin where rents fell sharply. Although benign rental growth is a positive for tenants, this reflects low incomes growth rather than an increase in supply providing more choice. Continuing strong migration and low first home buyer numbers, particularly in Sydney and Melbourne, are offsetting the impact of significant new residences, particularly units, entering the market and the recent surge in investor activity. 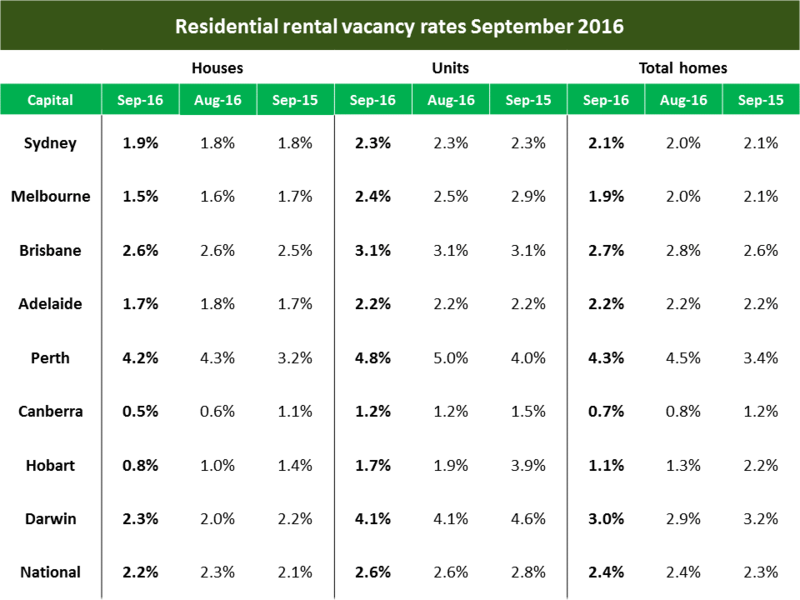 Shortages of house rentals will continue to push tenants into unit accommodation and keep vacancy rates relatively low overall. Perth, Darwin and Brisbane remain the exceptions with sharply declining migration levels through the end of the mining boom providing a more positive environment for tenants with higher choice and lower rents. Perth house and unit rents continue to fall although vacancy rates are showing early signs of steadying but remain at high levels. Perth house rents continue to fall with house rents now down to $380 per week and units at $320 per week. Perth house rents have fallen by 9.5 percent over the past year with annual unit rents down by 11.1 percent. Perth rents are now the lowest since the March quarter 2011 – over 5 years ago. Although Perth vacancy rates remain clearly the highest of all the state capitals, rates for houses were steady at 4.7 percent over September and fell to 4.7 percent for units. Sydney rents remained steady with the smallest of margins still separating units from houses despite record new apartment building. Vacancy rates for houses eased slightly to year highs although unit vacancy rates tightened. Sydney median weekly asking rent for both houses and units remained at the record high levels of $530 and $525 respectively. Sydney unit rents have increased by 2.9 percent over the past year – second only to Canberra for annual growth. Sydney house rents however were steady over the past year. Melbourne house and unit rents were again steady at record levels however vacancy rates for houses remained tight with unit rates falling despite new rental stock entering the market. Melbourne median weekly asking rents for both houses and units again remained at the record levels of $400 and $380 respectively over the September quarter. Melbourne house rents have increased by 2.6 percent over the past year with annual unit rents up by 2.7 percent. Brisbane rents have steadied with moderate vacancy rates indicating reasonable choice for tenants with unit rates continuing to rise as significant levels of new supply enters the market. Brisbane remained steady over the September quarter at $400 per week for houses and $375 per week for units. House rents in Brisbane have remained steady over the past year overall with unit rents increasing by 1.4 percent. Rising vacancy rates indicate the likelihood of continuing downward pressure on rents for both units and houses. Adelaide rents were flat following falls for both houses and units over the previous quarter with vacancy for houses easing and units steady. Rents in Adelaide remained at $355 per week for houses and $285 per week for units over the September quarter. Both house and unit rents in Adelaide have also remained steady over the past year. Vacancy rates for houses however remain tight at 1.8 percent with unit vacancy rates higher but steady at 2.2 percent. Hobart rents for both houses and units fell over the September quarter – down by 5.7 percent to $330 for houses and falling by 0.9 percent to $280 for units. Hobart house rents were steady over the year ending the September quarter with unit rents increasing by 1.9 percent. The Darwin rental market is showing early signs of steadying from recent sharp declines with house rents steady although unit rents are still falling sharply. Vacancy rates for houses have tightened although unit rates are still high and easing. Darwin house rents were steady at $550 per week over the September quarter following 6 consecutive quarterly falls. Unit rents however fell by 3.4 percent over the quarter to $425 per week – the lowest level in over 7 years. Darwin house and unit rents have fallen steeply over the past year down by 6.8 percent and 11.5 percent respectively. Darwin house vacancy rates continues to tighten and are now just above Sydney at 2.1 percent, unit vacancy rates however remain high and are still rising. No relief for Canberra tenants with rents for houses rising again and units remaining steady with ongoing tight vacancy rates likely to continue to put upward pressure on rentals. 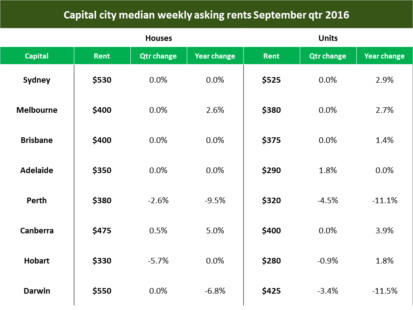 Canberra median weekly asking house rents increased again over the September quarter up by 0.5 percent to $475 with unit rents steady at $400. House rents have increased strongly by 5.0 percent over the past year with unit rents up by 3.9 percent – the highest of all the capitals. Canberra vacancy rates remain very low for both units and houses indicating the clear potential for further rent increases over the near-term although unit vacancy rates have eased recently. Gross rental yields for investors remained relatively steady over the September quarter reflecting reasonably similar local price and rental outcomes in most capitals. Hobart clearly continues to provide the highest gross returns for houses at 5.65 percent and higher over the quarter with Sydney clearly the lowest at 3.41 percent but down over the quarter reflecting higher local prices. Yields for units also generally remained steady over the quarter with again Hobart the highest at 5.86 percent with Sydney the lowest at 4.07 percent. To keep up to date with the latest property market information keep visiting our blog or facebook. Are you the proud owner of a new investment property? One of the most important things to do once you've purchased your property is to sort your landlord insurance. But Landlord Insurance can be tricky to navigate, especially if you're not sure what to look out for. Often the wording between policies can mean the difference between a smooth claims process, or an expensive headache. 1. Loss of rental income; this comprises more than half of all landlord insurance claims! 2. Malicious and accidental damage; this can range from claims for specific repairs to clean-ups. 3. Water damage: this involved damage to the property from leaky appliances or faulty plumbing. Be careful, as not all premiums cover tenant-related water damage. 4. Storm damage; this can be an extremely costly oversight, depending on how prone your area is to storm or weather related disasters. 5. Tenant death: this is a surprisingly common issue that many landlords encounter. Be sure to check your responsibilities as a landlord should this sad event occur (e.g. organising tenant belongings, speaking with the Police etc), and whether you will be covered for the loss of rent.